Greeting ocean explorers! It is official: we are sailing. 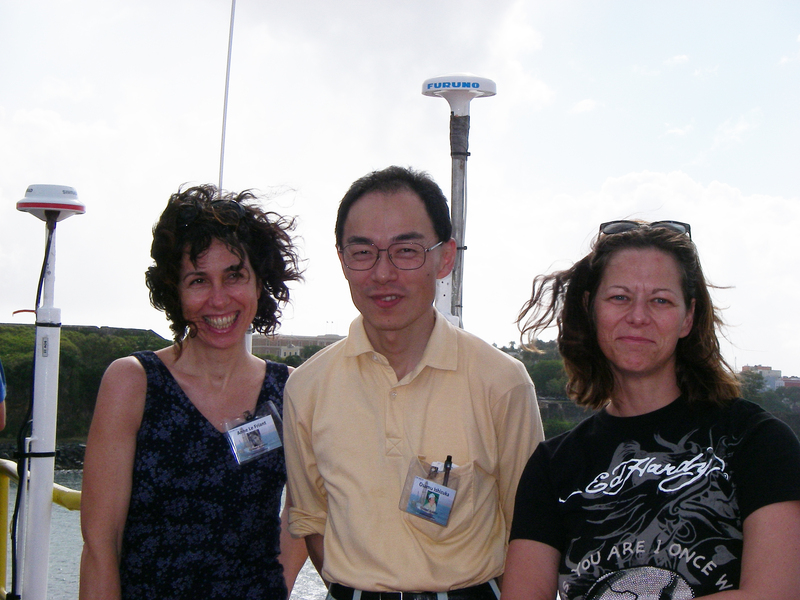 We left port from San Juan, Puerto Rico on March 5 and are en route to our first sampling location. It was a great feeling to hear the props turning, engines humming and tugboats assisting as we left the harbor. The entire science crew was on deck for the Bon Voyage, filled with excitement and anticipation of the earth’s mysteries that would be revealed during Expedition 340. This logo on the port and starboard side of the JOIDES Resolution says it all; we are beginning our journey as ocean detectives hoping to uncover the earth’s mysteries preserved in the ocean’s floor. Its official no going back, the gang plank has been hoisted we are now all aboard. This photo of the ship’s wake was taken from the stern of the JR as we set sail and had our last glance of land for 40 days. 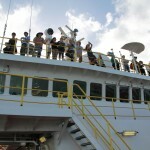 The Expedition 340 science party assembled on the main deck as we set sail for the Lesser Antilles. Meet the chief scientists for our Expedition who have collectively written the script for this exploration through the proposal process. 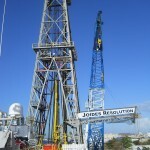 Because of their success we will soon attempt to retrieve our first glimpse of the seafloor around the islands of the Lesser Antilles at greater depths than before possible thanks to the technology and brawn of the JOIDES Resolution. Photo of Teresa in safety gear with USF’s Rocky the Bull and Honors’ class mascot Mr. Flajelly the Penguin. First task after we had sailed a few hours was to have our all hands Safety Drill. When the very loud bell rang, we all grabbed our life vests, eye goggles and hard hats. Sort of like ‘March of the Penguins’ we all climbed the stairs to the life boats to await our instructions. 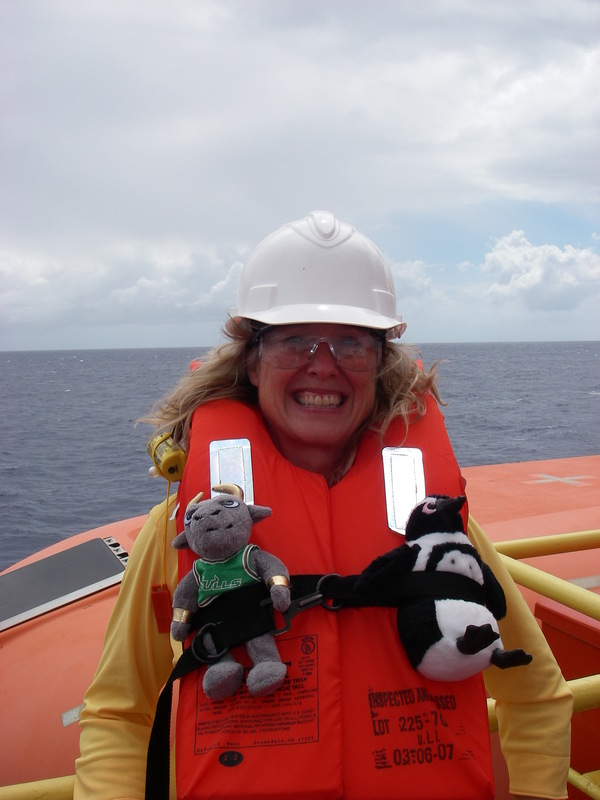 Joining me for the safety drill were two VIPs aboard the JR, USF’s very own mascot Rocky the Bull and another mascot Mr. Penguin from the USF Honors College students in my class this semester. 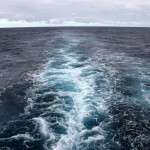 Print article This entry was posted by greely on March 13, 2012 at 6:52 am, and is filed under Oceanic Updates. Follow any responses to this post through RSS 2.0. You can leave a response or trackback from your own site.